Few forms in the design world are as iconic as the Airstream, that curved, aluminum-clad camping trailer from 1930s America. So when the board of the Vermont chapter of the American Institute of Architects was pondering ways to make the profession of architecture more visible to the public during its last annual retreat, it's no surprise the famous shape sprang to mind. What was new was how these design professionals envisioned the trailer's use: as a perfect vehicle — in both senses of the word — for bringing outreach and education about architecture to all points of a mostly rural state. 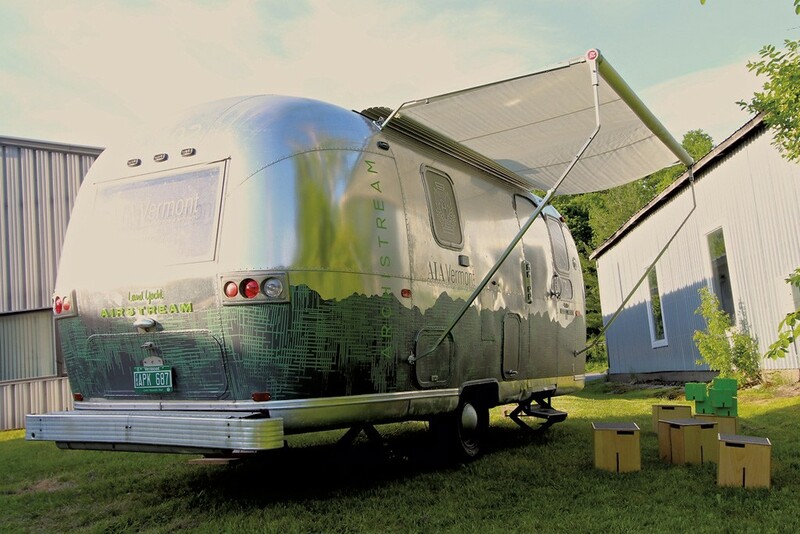 After landing a $42,750 Innovation Fund grant from AIA for the project, the Vermont chapter purchased a 21-foot 1969 Airstream Globetrotter from a retired couple in central Vermont. Then it charged an undergraduate architecture class at Norwich University with redesigning and rebuilding its gutted interior. The Archistream, as AIAVT has dubbed its mobile classroom, is now complete. Before it heads to a town near you, it will spend the summer inside the ECHO Lake Aquarium and Science Center in Burlington as part of the center's newly launched interactive exhibit on building and design, "KEVA Planks: The Fusion of Art and Science." While the Archistream is parked there, visitors will be able to step inside and check out two exhibits. One, by White River Junction architect Daniel Johnson, showcases the renowned Finnish modern architect Alvar Aalto's native works and their landscapes, using four models and a video. The other exhibit documents the making of the Archistream by the Norwich team — the 10 juniors and seniors in Montpelier architect Tolya Stonorov's spring semester design-build studio. Their stunning built-in work is an exhibit in itself. With Stonorov's guidance and in regular consultation with an AIAVT team — consisting of architects Diantha Korzun (TruexCullins, Burlington), Diane Gayer (Vermont Design Institute, Burlington) and Tom Bachman (Gossens Bachman Architects, Montpelier) and TruexCullins designer Joshua Chafe — the students created seating at both ends of the vehicle, undulating plywood ribbing for shelves, a flatscreen television and three tablets for video viewing. Kristina Hebert, a junior who was in charge of lighting, hit on the idea of underlighting the green resin worktable and counter with LEDs (light-emitting diodes). "The AIA team wanted a wow factor," the 21-year-old explains. The class fitted its built-ins to the vintage vehicle's curves with the help of a 3-D laser scan of the Airstream and digital fabrication tools such as a computerized router. "It's honest, clean and simple," comments Stonorov, who earned her master's in architecture from the University of California, Berkeley. Stonorov Workshop, the Montpelier firm she runs with her husband, Otto, is known for the same precision and attention to materials evident in the Archistream. The vehicle's interior, she adds, is "modern but respectful of the shell." For that reason, Stonorov suggests, it embodies a primary aim of architects in Vermont today. "Vermont has this beautiful vernacular architecture [of historic barns and pitched-roof farmhouses]. As architects, our challenge is: How do we create modern architecture within this context?" she says. As an AIAVT member, Stonorov is free to borrow the Archistream to, say, exhibit a digital flipbook of various architects' solutions to this challenge. Roughly two-thirds of Vermont's 327 licensed architects belong to AIAVT, according to the chapter's executive director, Carol Miklos. The organization is still working out a long-term solution for hauling the Archistream around the state — it may have to invest in a truck — but meanwhile the vehicle is at members' disposal. "It's a great service to our membership, and it's outside of dues," says Korzun, a former Vermont chapter president. The architect adds that the project won grant money partly because it helps the national group with its "repositioning" effort, aimed at convincing younger architects of the professional organization's continued relevance. The Archistream will also host a digital display of the buildings submitted for AIAVT's annual design awards. Previously the public would have learned about the buildings only by seeking out the organization's website or in an exhibit rotated through select galleries and the Statehouse every three months. Sitting in TruexCullins' conference room — one of its windows emblazoned with the Louis Kahn quote "Light is the giver of form" — Korzun ticks off other plans for the Archistream. It could travel to disaster sites — think post-Irene — to foster community discussion with an architect about how and where to rebuild. The AIA could match up a school intending to renovate or re-landscape with an architect who would use the Archistream to engage students in working out solutions. It could collaborate with other entities such as the Preservation Trust of Vermont or the Richmond town energy coordinator — both partnerships are under way — to host informational seminars in the Archistream. Or the vehicle could be towed to the town hall, town green or farmers market of a burg concerned with strengthening its livable center. "Vermont's population is increasing," Korzun notes. "Certain areas are sprawling, and towns are losing their sense of community. Architects can play a big part in changing that." Indeed, the Archistream will be useful for educating the public about the simple fact that "architects don't just do buildings," as Miklos points out. Johnson, the Aalto aficionado and another former AIAVT president, says the vehicle will be "hugely useful" for communicating that architecture is "available and important" — and not just for "cool, big stuff" like museums or university buildings. "Architecture is not some mysterious thing for rich people," Johnson declares. He plans to emphasize that point with his Aalto exhibit. The Finnish master built structures that are "humble, simple, elegant," Johnson says. "He was very much a humanist. He did a lot of worker housing and town plans. He created modern architectural beauty for everyday citizens." The Archistream's first users will be encouraged to create their own architectural beauty, according to Stephen Perkins, director of development and community relations at ECHO. "You could grab a pile of blocks" — the exhibit has put 15,000 identical 4-and-a-half-inch-long KEVA planks at visitors' disposal — "and bring them into the Archistream and build something on the table in there," he suggests. "I think it will be tons of fun."